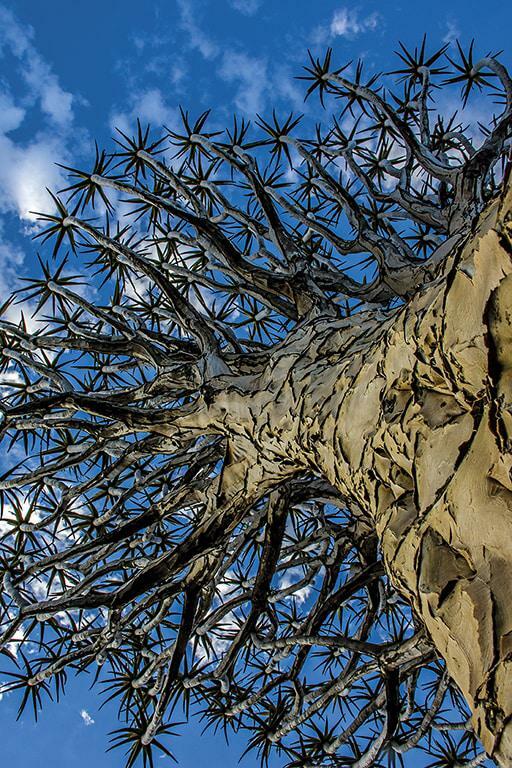 HERMAN SMIT WRITES: I took this photo at the quiver tree forest near Keetmanshoop in Namibia. My lens was at its widest (18mm), my aperture was f18, my shutter speed was 1/100 second and my ISO was 800. I had given the tree a quick hug to soak up some of its energy, and when I looked up I knew I had to take its picture. TOAST COETZER SAYS: I’m glad you looked up! The quiver tree (actually an aloe) is easily the most photogenic tree around. You can shoot it from any angle and your photo will catch the eye. I like this one’s shape: a strong, almost human-like outline made by the trunk and branches, and leaves that look like fingers. There’s good detail on the bark in the foreground, which gives you an idea of what the tree must feel like to hug. If you want to highlight the shape of a quiver tree (or any tree), try to adjust your angle so that the tree stands out above the horizon against the sky. Herman chose a narrow aperture of f18. This ensured that all the elements in the frame are in focus, from the trunk in the foreground to the furthest leaf in the background. This photo originally appeared in the February 2018 issue.